Flow Conversions – wastewater terminology uses “million gallons per day” (mgd) when discussing flow. River terminology uses “cubic feet per second” (cfs). 1 mgd is equivalent to 1.55 cfs. Assimilative Capacity – the capacity of a river to accept and dissipate pollutant discharges without exceeding water quality standards. Reasonable Potential (RP) analyses – a determination of whether a discharge causes, has the reasonable potential to cause or contributes to a water quality parameter exceeding above a criterion of a State water quality standard. The assessment evaluates treatment performance, the variability of the pollutant or pollutant parameter in the treated effluent, the sensitivity of a given species to toxicity, and where appropriate, the dilution of the effluent in the receiving water. Nutrient Season – the current timeframe established by the EPA for when numeric nutrient standards apply. July 1 to September 30 for the Northern Rockies ecoregion. Nondegradation – Montana’s Water Quality Act requires DEQ to protect high quality state water from degradation. DEQ nondegradation rules were adopted to implement the Act. Nondegradation rules apply to any activity that may affect the quality of surface or groundwater. Nondegradation determinations are typically associated with a mixing zone. Mixing zone – a limited area, within a surface water or groundwater, where dilution of a discharge may legally occur. All applicable water quality standards and nondegradation limits must be met at the end of a mixing zone. The first answers are clear, factual answers; the follow-up explanations (in italics) are more details that can be used in certain situations requiring more in-depth answers. Can direct discharge have a positive impact on the ecological health of the river? Under the current condition, direct discharge will not have a direct positive impact on the ecological health of the river. The lowest flows on the Gallatin River, just below the confluence with the Middle Fork of the West Fork, are typically over 150 cubic feet per second (cfs). The District currently recycles and reuses an average of 0.6 cfs, and the peak amount is approximately 1.2 cfs. This is not enough effluent to routinely, positively impact the river. If treated to Limits of Technology, it also may not be enough effluent to routinely, negatively, impact the river (this will be evaluated in the District’s 2018 work). Were the district to discharge directly into the river, the quantity of effluent is not sufficient to significantly increase the flows in the Gallatin River. On the other hand, if treated to Limits of Technology, the maximum discharge would not negatively impact the river. Can wastewater be treated to a level that ensures no negative impact to the ecological health of the river? Yes, in theory, wastewater can be treated to a level that would all but ensure no negative impact to the ecological health of the river. It would be very expensive, however, were it necessary to discharge into the river, protecting the river’s ecological health will be the District’s overarching goal. There will be two components to the study for treatment and the river’s assimilative capacity. –Treatment: The goal will be to develop a treatment plant design that optimizes effluent quality but is feasible to finance, construct, and operate. – Assimilative Capacity: The second component at play in the future of the project is the federal and state regulatory framework that is in place to determine what “no negative impact” means. National and state regulations utilize a receiving water’s assimilative capacity, reasonable potential analyses, mixing zones and potentially, dilution credits in permitting publicly owned treatment works within the framework of the Clean Water Act. What monitoring is needed to ensure there are no negative impacts to the ecological health of the river systems? Monitoring will include water quality and a variety of biological surveys and assessments. This monitoring will be done by a variety of internal team members and external partners. The project team includes an aquatic ecologist and trout fisheries expert who will assist with development of a monitoring plan designed to assess current and future ecological health of the Gallatin River. This work will be coordinated with the Gallatin River Task Force. Where could (or would) direct discharge occur? Gallatin River, West Fork Gallatin River or other streams? Where will it be most beneficial to the ecological health of the river systems? Discharge into the Middle Fork of the West Fork and the mainstem of the Gallatin will be evaluated in the spring of 2018. The additional flow could be beneficial to the West Fork, but it is impaired and has a Total Maximum Daily Load (TMDL) limit in place that deters discharge. In addition, the existing regulatory framework strongly favors discharging to higher flow rivers, like the mainstem Gallatin, whenever possible. When will direct discharge occur? Winter, spring, summer or fall? When will it be most beneficial to the ecological health of the river systems? The decision on when discharge would occur is part of the engineering work and effluent disposal study which will be conducted in spring/summer of 2018. There is some flexibility in the timing of discharges, but the shorter the discharge window the greater the effluent flow would have to be, and vice versa (longer discharge window, lower instantaneous effluent flow). The effluent would not generally lead to significant increases in streamflow but it is most likely to have no significant effect outside of the defined “nutrient season” (July 1st – September 30th). What would the quantity of direct discharge be and what will be the impact to streamflows? The district currently produces effluent at flows from 0.25 to 1.2 cfs (0.6 cfs on annual average basis). At this time, all of this effluent is stored and reused for irrigation, and the District will continue to do this and to expand reuse where practicable. Unless growth stops, eventually there will be surplus effluent. The quantity and flow of the surplus will be estimated as part of the 2018 work, but would generally be between 0.1 to 1.5 cfs. The Gallatin River flows at a range from 150 to 5,000 cfs, depending on the season and the water year. The impact of discharge flow on the Gallatin Rivers streamflow is not significant. Direct discharge of effluent to the Middle Fork of the West Fork would potentially be significant (noticeable), but the regulatory framework favors discharge to the mainstem of the Gallatin due to its higher flows. What will the quality of direct discharge be and what will be the impact to streamflows? The specific qualities of the future treated effluent will be estimated as part of the engineering work taking place in the spring and summer of 2018. In general, the quality will be excellent, cleaner than the river with the probable exceptions of nutrients (nitrogen and phosphorus) and some trace organics that are recalcitrant (resistant to treatment). However, the treatment processes being evaluated would result in concentrations of these constituents that are much lower than approximately 99% of all wastewater effluents in the country. In combination with the river’s assimilative capacity, a mixing zone and dilution credits, there may be no reasonable potential of causing or contributing to a water quality excursion. This evaluation is at the core of the 2018 studies. Can direct discharge be conducted in a way that meets requirements for non-degradation and Montana’s nutrient standards? Yes. This is part of the engineering study and thoroughly analyzed in the spring and summer of 2018, and will be part of the regulatory and permitting work. At what point does wastewater turn from a liability into an asset? Wastewater is a liability any time it is not treated properly. Treated effluent, on the other hand, is already an asset in arid regions of the world, whether it is for irrigation, groundwater recharge or other beneficial reuse. The threshold for reuse of effluent being an asset is its beneficial use. 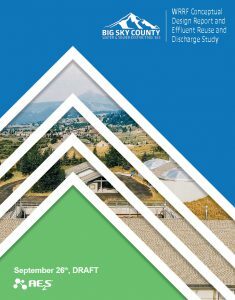 How does direct discharge compare to irrigation, snowmaking and shallow groundwater recharge in terms of “slowing the flow” of water through the system? The District is evaluating multiple disposal alternatives. Some of these would, in theory “slow the flow” of water through the Middle Fork of the West Fork watershed (e.g., groundwater recharge / infiltration basins, etc.). Irrigation would increase evaporation and evapotranspiration. The fate of water used for snow-making would depend on rate of melt-off and groundwater levels, but it would likely contribute to spring runoff. Direct discharge would decrease the amount of time that water spends in the Big Sky basin. However, it would also result in less evaporation. It could be stored and discharged strategically. Is the ecology of the Gallatin River significantly different from that of other rivers in southwest Montana into where direct discharge is occurring? The Gallatin River is generally cleaner and cooler, especially in the upper Gallatin. This does result in a somewhat different ecology than other rivers in Montana. In general, and perhaps counter-intuitively, federal and state regulatory frameworks actually favor direct discharge to cleaner rivers, because these rivers are believed to have more “assimilative capacity” for constituents in treated effluent. Is there a way to avoid or alleviate potential negative impacts of the mixing zone on water quality, fish movement, and habitat? All options will be evaluated and consider the impacts of mixing zones, water quality, and fish movement. The siting of any outfall will consider fish movement and habitat. The outfall design will strive to maximize the mixing of the effluent as it enters the river, with the goal of minimizing the size of the mixing zone to the extent practicable. Will you be putting sewage or wastewater in the river? No. Any treated effluent water discharged to the Gallatin River would be the end product of an advanced wastewater treatment process, in most respects* purer than river water and meeting drinking water standards. *The potential exceptions are nitrogen, phosphorus, and some recalcitrant trace organics. What kind of treatment will be used in the upgraded Water Resource Recovery Facility? The exact treatment regime that will be used in the upgrade is the subject of the 2018 engineering work. The District has hired a team of engineers to identify the optimal treatment process for the upgrade. This work will be conducted over the spring and summer of 2018. Generally, the treatment process will consist of biological nutrient removal, membrane filtration, and chemical treatment (e.g., ozonation / advanced oxidation). Ozone and other advanced oxidants react with contaminants extremely rapidly (in seconds). No treatment chemicals will be discharged from the new treatment facility. How much wastewater is currently treated and what is the treatment method? How much unused capacity does the District have? Currently the District treats an average of approximately 400,000 gallons per day. The District’s treatment facility has more than enough treatment capacity for average flows, but peak ski/holiday season flows are beginning to encroach on the facility’s design limits. The District uses Sequencing Batch Reactors (one of many variations/configurations of biological treatment), conventional filtration (coagulation of solids prior to filtration through anthracite and sand) and chlorine disinfection. Effluent storage and disposal capacity is currently more critical, but additional disposal capacity through appropriate effluent irrigation will be provided in 2018 on the Spanish Peaks golf course. How will you monitor the effluent going into the river? Effluent from the existing and future treatment facility is, and will continue to be, monitored according to Montana and National Pollutant Discharge Elimination System (MPDES/NPDES) permit requirements. In addition, the District is working with multiple engineers, a fisheries biologist, and the Gallatin River Task Force to develop a monitoring program to meet the MPDES requirements to capture additional data on any effluent impacts to the watershed. Are there any conservation measures integrated into the future? Yes. Water conservation has always, and will continue to be a priority for the District. At what point will water be released to the river? The District will be evaluating the permitting requirements for surface water discharge in the event that is needed to the Gallatin River and also for using reclaimed water for snowmaking. A treatment facility will be designed that would be capable of meeting or exceeding the permit requirements. Planning, permitting, funding, designing, and constructing the resulting project will take three to five years. What does “Limits of Technology” mean? Limits of Technology is a term used in the wastewater treatment field to identify the boundaries of current treatment technologies that demonstrate effectiveness in the municipal wastewater industry. For the purposes of this project, it has been defined as wastewater effluent quality, specifically regarding the reduction of nitrogen, phosphorus, and trace organic contaminants, which is achievable using equipment and/or treatment processes that have a demonstrable track record of effectiveness in the municipal wastewater industry and are within reasonable economic and operational constraints. Technologies that generally meet this definition include biological processes, membrane microfiltration, activated carbon adsorption, and advanced oxidation. An example of a technology that does not meet this definition is reverse osmosis (RO), as there is currently no affordable means of disposing of the brine that would be generated by the RO process. What is the timeline for starting snowmaking? How much time will this take? The Montana Department of Environmental Quality (DEQ) has never been asked to permit snow-making with effluent. The District is currently collecting data to provide to DEQ so a permit can be developed. It is anticipated that this process could take one to three years. Has effluent ever been released into the river? Treated effluent has never been deliberately released to the Gallatin River by the Big Sky County Water and Sewer District infrastructure. The 2016 spill from the Yellowstone Club storage reservoir was treated effluent from the District’s existing wastewater treatment facility and treated water from YC’s treatment plant. However, as the water travelled from the Yellowstone Club reservoir to the Gallatin River it picked up sediment from erosion and carried it to the tributaries and then the river. Controlled discharge of effluent through a pipeline and engineered outfall would not have the same result and their would not be any visible plume in the river. Can the District control development? No. Gallatin and Madison Counties are responsible for zoning and platting of the Big Sky area, including the areas within the District’s boundaries. Once land within the District is platted, the District is legally required to provide water and sewer service to our residents. What does the District currently do for reuse and recycling of water? Is this the most they can do? Currently the District reuses effluent to irrigate the Community Park, Meadow Village Golf Course, Church, and District office grounds. The District also pumps effluent to the Yellowstone Club for reuse on the Yellowstone Club Golf Course and other landscape irrigation. In 2018 Spanish Peaks will begin taking District effluent for reuse on its golf course. The District is evaluating other means to reuse effluent, including expanded landscape irrigation, groundwater recharge, and snow-making. The project team the District has hired will produce an Effluent Disposal Study and Preliminary Engineer Report for wastewater treatment upgrades. The Effluent Disposal Study will evaluate the feasibility and cost of expanded and new disposal methodologies (including increased landscape irrigation, snow-making, groundwater recharge, and discharge to the Gallatin River). This work will determine the feasibility of multiple disposal alternatives, including evaluation of agronomic uptake rates, soils studies, topography and vegetation surveys, and the assimilative capacity of the river. Simultaneously, engineers on the project team will be evaluating treatment processes and recommending a final treatment process train for the new Water Resource Recovery Facility (WRRF). This work will utilize the most current research on treatment process performance (including nutrient removal, pharmaceutical and personal care products (PPCPs) treatment). The cost of construction and operational maintenance and replacement (OM&R; i.e., labor, energy, chemical, etc.) requirements will be used to develop life-cycle cost analyses. The recommended alternative will be the process train that provides the highest quality of effluent at an affordable life cycle cost for District ratepayers. What about all the other studies that have been done? The work that the District is currently conducting will build on all existing data, including previous effluent disposal studies, engineering reports, and water quality data collection efforts. How does wastewater treatment protect our natural resources? Water Resource Recovery Facilities (WRRF) remove or drastically reduce solids, organic matter, microorganisms and nutrients (nitrogen and phosphorus) and other contaminants. The effluent is recycled, displacing drinking water use for irrigation of golf courses and landscapes. The biosolids are safely composted with sawdust and used for plant and grass fertilizer. Will there be limits on discharge?